Rubbed Effect Varnish, a one-component interior varnish based on urethane alkyd resins, gives a rich clear amber satin finish. For maximum durability, clarity and depth, apply two coats of Rubbed Effect Varnish over several coats of Epifanes Clear Gloss Varnish, Epifanes Wood Finish Gloss or Epifanes Polyurethane Clear Gloss. Rubbed Effect Varnish can also be applied directly to bare wood. 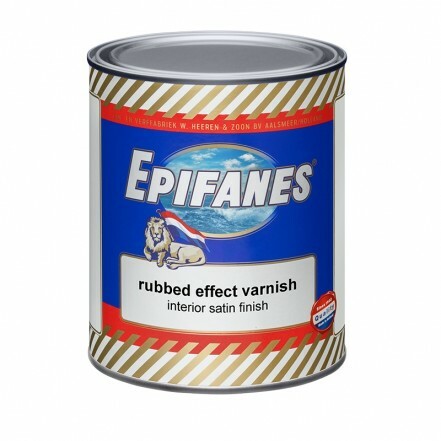 Rubbed Effect Varnish can be applied to any interior softwood or hardwood and is highly recommended for cabin sole, doors and trim. Its hard satin finish has good scratch and scuff resistance and is impervious to most onboard chemicals..